Galileo K-12 Online provides clients with a complete educator-friendly online instructional improvement and effectiveness system. The system includes a broad range of online modules designed to promote student learning via rapid and flexible access to assessment, curriculum, reporting, instructional, intervention, and educator effectiveness tools. Galileo assists users in establishing local goals, assessing goal attainment, forecasting student performance on state assessments, and using assessment information to guide instruction, enrichment, and professional development. In addition, the fully integrated Galileo Digital Curriculum Platform makes it possible to effectively and efficiently coordinate instruction, assessment, communication, and collaboration in ways that promote student learning. 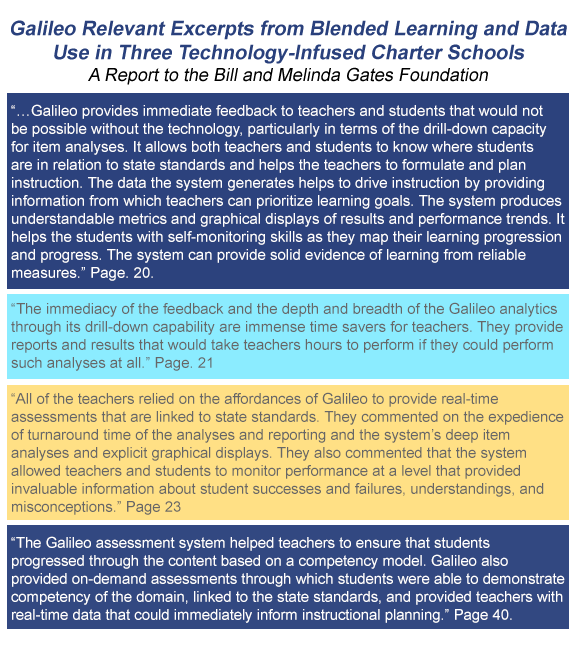 ATI is proud to share that the positive impact of Galileo use was described in the recently released report to the Bill and Melinda Gates Foundation: Blended Learning and Data Use in Three Technology-Infused Charter Schools. The report describes research conducted by WestEd and examines how the use of technology in the blended learning environments of three Arizona charter schools serving populations of challenged middle and high school students impacted teaching and learning activities. All three schools implement Galileo K-12 Online. Read the full report to learn more or schedule a Galileo Overview, today. Link here to learn about WestEd's key findings.